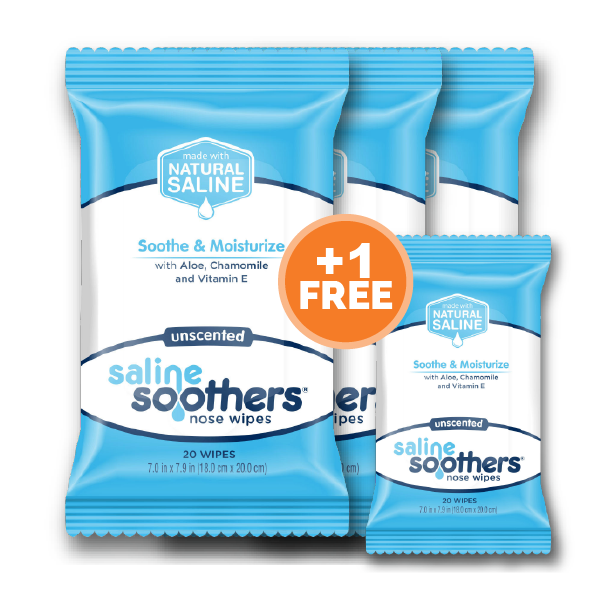 3 packs of Saline Soothers® for just $7.99 plus shipping. 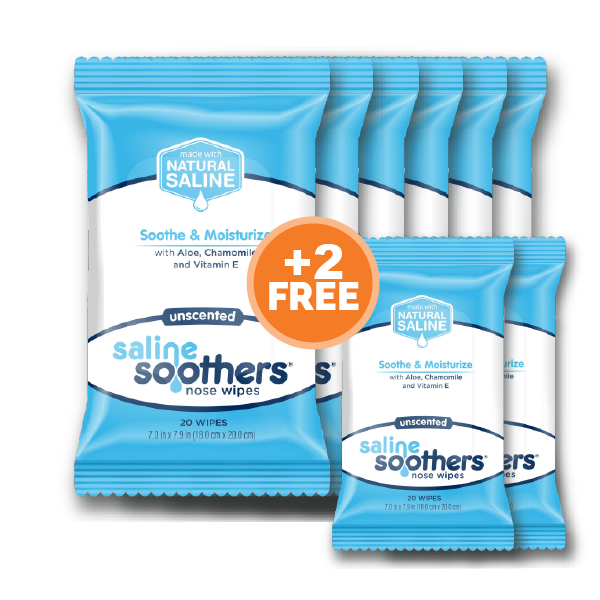 Order 3 packs of Saline Soothers® for just $7.99 plus shipping. Get an extra pack free for a total of 80 wipes, great for at home or on the go! Got a sample and really liked the scent of them. I found much more to use these on than just noses! They work well on items that have finger prints as well! Saline is a natural way to provide relief to noses irritated by colds and allergies. My son loved these, his nose always gets irritated with a cold. I got a chance to try these at the perfect time - I have a cold! Within a day my nose was already red and irritated. Typically I steal the girls' Boogie Wipes, so it was great to have a product that was unscented and designed for an adult. Very gentle and soothing. They are soft on my nose and leaves it feeling refreshed, instead of dried and chapped after blowing it over and over again. I love that they are made of all natural saline. Also that they are not scented too, so I do not have to worry about the smell or the ingredients used to make the smell bothering my nose. I love that they are for adults. They're soft on my nose, yet strong for the big messes. After I finished using it, my nose felt refreshed and soothed (not irritated like after regular tissues). The unscented was nice too (not overpowering). The ONLY thing I'd change is the packaging. When I received this in the mail, I didn't realize it was from Nehemia (the package was unmarked) and I thought it was some weird generic knock-off. You have such great recognizable branding with BoogieWipes-I would recommend trying to incorporate something from that into this. Maybe use the same recognizable font from the "Boogie Wipes/Mist" into the "Saline Soothers". I like how the two O's look like a face/nose with the saline drop--I would accentuate that more--just like "Boogie" has the 2 kid faces. So, to recap-- if you had that same playful font as "Boogie" and made the o's and saline drop look like a face-that would be better. (Maybe even put a little "seal of approval" stamp saying "From the makers of Boogie Wipes"). I think you could still keep the "soothing, zen-like" feel but add recognizability. I love how easy they are to use and that they are easy to toss in my purse and take anywhere. 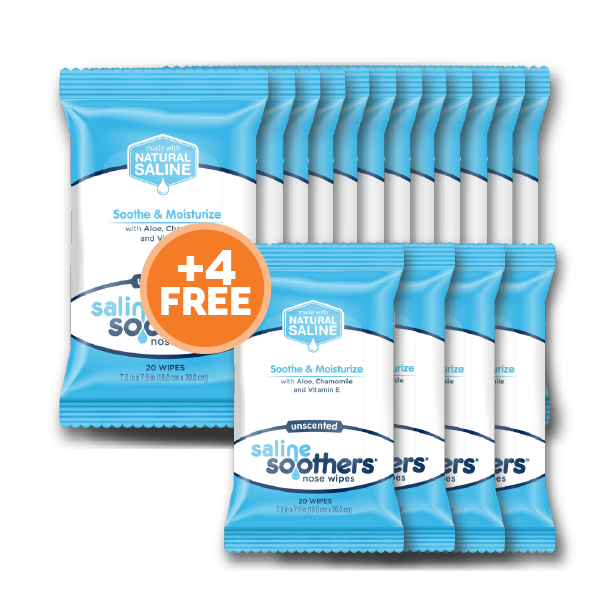 My entire family has been sick for almost a month and these Saline Soothers helped with the rawness that comes along with the contestant nose blowing. I love not only the effectiveness of them,but these saline wipes are incredibly durable,and large enough to do the job right. They're also gentle enough to use on my 9 month old. My one year old had a runny nose last week and she absolutely hates having her nose wiped. These were a life saver,so gently on her nose that she actually allowed me to wipe her nose with them! Plus they didn't leave her with an irritated red nose. I have children with allergies these are perfect for their stuffy noses. I though the saline soothers were great for my son. With the germs going around with our backwards weather these were great for him to keep with him in his book back. They didn't bother his skin or his little red nose when he had the sniffles. He said his nose doesn't hurt as much now. I love how gentle it is and better than just a regular rough,dry tissue. They are easy to use and gentle on your nose. I love it! it's easy on the nose and helps clear up sniffles. My husband is always stealing baby wipes for his nose and now we have an awesome effective solution. A nice alternative to tissues. They provide the perfect amount of moisture to wipe runny noses without causing irritation. 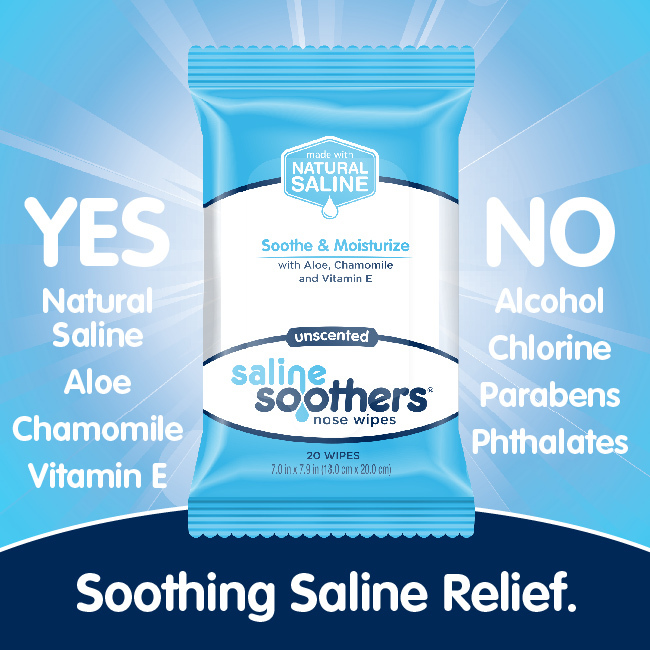 Saline Soothers are wonderful! I love the way the take care of my nose, they are soft and very soothing! There was no irritation or strong scent. The scent is light and fresh, the cloths are thick enough to be soft, and just damp enough to be effective!